August is in full swing which means school is back in session, tailgating is around the corner and it's time to start thinking about Fall recipes. 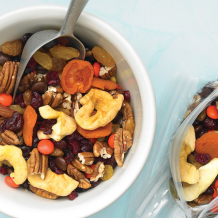 One of our favorite, family friend recipes are Easy Fall Trail Mix Ideas. Not only will you save money doing it yourself, but they are even tastier than store bought! Talk about a total mom win! -Kicking off our list is a Fall dessert classic that is even more fun on the go. Your kids will never want to leave home without this Hershey S'more Trail Mix. -I don't know about you but our tailgates are never complete without Buffalo Dip. Now you can take the spice with you to away games with this Buffalo Hot Wings Chex Mix. -My oh my, we love apple pie! Apple Pie Trial Mix that is! Kids will have a blast making this hands on mix and you won't feel guilty about sneaking a bite because it's so yummy. -If Halloween is your favorite Holiday, you're in luck! This spooky Harvest Hash Halloween Trail Mix is a hit, no black cauldron required. -To of Fall's best flavors collide for this yummy Caramel Cinnamon Chex Mix. Perfect to chow down on while snuggling up for a great Fall movie! What is your favorite trail mix concoction? We love finding new combos we love!